The IBM POWER9™ processor, which is available at frequencies of 3.55 - 4.0 GHz. Supports up to 64 TB memory. Integrated I/O subsystem and hot-pluggable Peripheral Component Interconnect Express (PCIe) Gen4 slots, double the bandwidth of Gen3 I/O slots. Supports EXP12SX and ESP24SX external disk drawers, which have 12 Gb SAS interfaces and double the existing EXP24S drawer bandwidth. 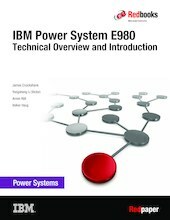 This paper expands the current set of IBM Power Systems documentation by providing a desktop reference that offers a detailed technical description of the Power E980 server.